While the Government, Council, Auckland Transport and NZTA think we do not need separated/dedicated transit facilities such as bus ways or rail to the Airport for another 20-odd years tourists, workers, families and anyone else trying to get to the airport did not get very far yesterday. 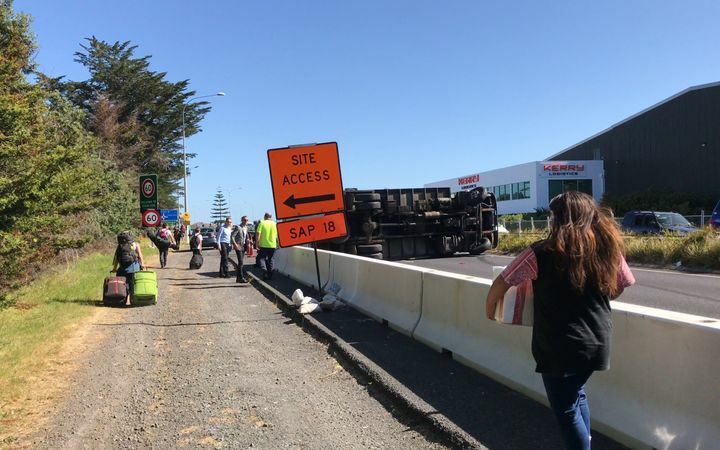 Two truck crashes caused delays getting in and out of Auckland Airport along State Highway 20 this afternoon but heavy traffic has since cleared. The first truck, carrying a large amount of gravel, rolled on the southbound near the Portage Rd overbridge about 4.20pm. The second truck crashed in the southbound lane just before 5pm on George Bolt Memorial Drive. People could be seen at the scene wheeling suitcases on foot towards the airport. That picture above says it all. Relegated to walking along a State Highway to get to your flight on a hot Summer’s day because we have no dedicated transit links to our international airport. Some serious Third World Infrastructure right there folks and our authorities say we have to wait another 20 years before we get decent transit. So how much damage to our reputation this time?